Software defined radios (SDRs) can–in theory–do almost anything you need a radio to do. Voice? Data? Frequency hopping? Trunking? No problem, you just write the correct software, and you are in. That’s the problem, though. You need to know how to write the software. LimeSDR is an open source SDR with a crowdfunding campaign. By itself, that’s not anything special. There are plenty of SDR devices available. What makes LimeSDR interesting is that it is using Snappy Ubuntu Core as a sort of app store. Developers can make code available, and end-users can easily download and install that code. Of course, the real value will be if people actually fill the store with meaningful applications. It certainly worked for smartphones. How many people would need a smartphone if they had to write their own code? Even finding software scattered around the Internet and installing it is beyond some users. On the other hand, we couldn’t help but think that for radios, just apps only gets you so far. What you really need is components that you can easily integrate. This is the idea behind GNU Radio (we’ve covered GNU Radio before). Granted, LimeSDR supports GNU Radio, too. However, an app store that can bundle GNU Radio applications and also allow installation of modules easily would be widely applicable and useful. On the other hand, maybe people who will use GNU Radio won’t have a problem just downloading stuff themselves. That begs the question of how many consumers need an SDR that allows them to download many applications? Time will tell. You can see a video about LimeSDR below. We have talked a lot about SDRs over the last few years, especially the RTL-SDR dongles. LimeSDR is a big step up in price and performance from an RTL-SDR dongle, though. How is this different from GNURadio with HackRF/bladeRF/USRP? GNURadio flows are also not “apps”, GNURadio is used to interact with RF signals and does not provide a stack for anything even “as simple as Bluetooth.” Yet they claim you can just download full Zigbee, WiFi, and even LTE basestations. This reeks of poor marketing used to get rid of some excess inventory. Reading between the lines of what is public information, the way I see it, they plan to (in conjunction with Canonical) using Snappy Ubuntu Core (IoT+Cloud) rent/sell SDR FPGA firmware to people. And they have some deal going in the background with EE(British Telecom) in the UK, and some other global telcos world wide to roll out 2G/3G/4G/5G nano/micro basestations. People will complain if a giant cell tower is constructed next door to their house, but micro/nano cells are next to invisible. Lets say you install a “Free” basestation application for your approved Telco, and then get a nanopayment for every phone call processed. Your device either acts as a relay or perhaps routes data through the Internet. A suspect that the apps they are selling are mostly for the FPGA and not the host computer, at least not fully. Please play by the rules, looking at your aggressive comment history in this thread it seems you defend every point in the video and campaign, and very quickly discount every other device as inferior. Also, the performance afforded by the LMS7002M is still mostly inferior to AD9361 based devices. Frequency range, sampling rate, phase noise, and bandwidth of this device are all about half of the AD9361. I never called any other device inferior ? A more expensive part has better, since when did that start happening ? wow, you responded to every post in this thread, do you work for this company? aren’t there rules against not disclosing that? Search for my user name I’ve been on Hackaday for 5+ years and posted thousands of times (generally only on topics that interest me), never worked for lime microsystems or on the limesdr. I have backed the product after reading through their source code and reading their LMS6002 and LMS7002 datasheets. Just to let you know, LimeSDR isn’t just “yet another SDR”. Parameters of LimeSDR are absolutely unbeatable for this price ($249 early bird / $299 full price). 12-bit dual transceiver (2×2 MIMO), 61.44 MHz bandwidth, 100 kHz – 3.8 GHz range. Only Ettus USRP B210 has similar parameters (just different range) and it costs $1199. Nuand bladeRF x40 has very similar hardware (same 40 kLE Altera FPGA, same USB 3 chip), but uses older RF chip from Lime Micro and so has worse range (starting at 300 MHz), worse bandwidth (40 MHz) and it is only single transceiver (not dual 2×2 MIMO). And it costs $420. HackRF can’t be even compared with this (only 8-bit and half-duplex), but costs $330. As far as SDR transceivers go, this couldn’t get any better for this price. VPN banned. The YouTube link wasn’t in the OP, thanks. YouTube isn’t banned here (yet). Youtube banned as well ? @ghosty, I’ll assumed you’re not trying to be insulting. Here in Indonesia the Internet has become highly censored in the past couple of years. The central government oversees the process. In that sense, I would certainly say that Intelligence is lacking at the government level. The censorship is holding back a country that is trying to advance into the 21st century. My suspicion is that they are not talking about Gnuradio at all, using USB would add far too far much latency. Most two way protocols you really do need almost everything to happen on the board inside the FPGA. BlasdeRF has one TX channel and on RX channel, LimeSDR has two of each. The earlybird (2nd flock) price is $249 not $200, the original earlybird was $199 and that is all gone. But even at $299 for MIMO it is still interesting hardware even without the app store. This is not only better than BladeRF, but has similar params to Ettus USRP B210, which costs much much more ($1119). To be fair the B210 has a very nice 100k LE FPGA in it, as opposed to the 40k LE FPGA in the LimeSDR, and it also it has a more expensive (higher specification) MIMO chip. What is the box at the 1 min mark? Looks like some kind of computer to support the SDR, anyone know? @AKA, the “price” is $250+85 for antennas. Still less than some SDRs, but more than my “just click it” money. Looks like they got a Mini-ITX board and plugged a PCI card into it and drilled 4 holes in the side of it for the 4 MIMO antennas. As for the antennas you can probably pick up 4 Chinese 2G to 4G antennas on the ebay/ali with 4 u.FL-SMA pigtails for under half that price. Well 5 pcs/10 pcs would have a decent jump down in price, than 4x 1 pcs. An app store implies an ecosystem of continuously changing software while the radio concepts listed here haven’t really changed since app stores have started to exist. It’s true that the sdr community could use better centralization and support, but the word “consumer” doesn’t seem to fit. While sdr offers an unprecedented level of flexibility to radio, I don’t see it as expanding the capabilities of the field as it is much more band limited than traditional radio hardware. I’m eager to see a Swiss army knife of radio debugging tools reach a mature and supported state no less! What exactly do you mean by “radio debugging tools” ? Any chance of a specialized product at a good price? As a ham, I’d love to see a low-power 40/20 meter SDR transceiver with app that I could use with a smartphone doing the heavy processing. It’d slip inside a shirt pocket and let me talk anywhere in the world. And where would your Antenna for 20/40 meters be ? Up in the tree, of course. I’m curious as to your reasons why you dislike them? It is open source (and hardware) so anyone can install their own firmware on it to interact with any software they want. The whole app store from my perspective is a gimmick that they think will sell their product. In my world (since it is open), dump anything I do not want and code your own. It is not like you are jailed in like iSheep products. No, they are a very naive reimplementation of them that completely miss half the point by just ignoring the hard questions like dependency management. And I’ll add that the major reason for their proliferation is not because they’re *good* (the vast majority of “app stores” created for products and devices have about 5 awful, entries on them which sit there and rot) – it’s because the creators see how much power (and wealth) the app store has given Apple. Organizations desperate for a usable business model and a way to stay relevant see this concept of an mandatory marketplace arbitrator as a holy grail. See Docker. Cargo cult-ism on a massive scale. Seems to me the major hurdle will be in FCC approval. Uncle Charlie will likely want the final product to be hardware restricted to certain frequencies to prevent possible “unlawful use” and that will defeat the Limes true potential. Why FCC approval, if is an exempted device in section 15.103 – test equipment. The HackRF One is test equipment that is currently exempt from FCC equipment authorization. That means legality of use is entirely the responsibility of the user. Also from the their crowd fund page “Power Output (CW): up to 10 dBm” which is 10 mW which is not atypical for test equipment. RP-SMA is only really used by Wifi antennas (2.4GHz and 5GHz), so probably a waste of money, unless you only want to use it for 2.4GHz. Best to buy a U.FL IPX to SMA, and a decent RG316 (or similarly shielded) cable or else RF will end up leaking into the device and generating birdies. But I am sure you can find even cheaper ones on AliExpress or eBay. Don’t buy RP-SMA, you don’t want it, only stupid wi-fi antennas use it. Buy normal female SMA. The LTE basstation app, I guess would be OpenBTS or YateBTS or Osmos or what it was called. .
Or it could be a closed app from a Telco. BOM is >$200, ~$300 with labour costs, real price will be starting around 600-700. No, you are simply wrong. If you count prices for buying in bulk, you can get to BOM of only $120 – $150 (e.g. LMS7002M should cost only $63 in 5000+ qty.). LimeSDR for $299 should be final price, even after campaign ends. No you are wrong the LMS7002M from Lime Microsystems will not cost $63 in 5000+ qty to Lime Microsystems for their LimeSDR. they would have to get >1mil in this campaign to produce 5K units. The marketing spin in the video really irks me. No, you cannot “just” download an LTE basestation “app” and run it next to a Bluetooth app. Generating the baseband signal and receiving/decoding the RF are an incredibly small part of any radio system. The RF front-end — amplification, filtering, switching, etc. — are really hard to get right in a standards-compluant way. In some cases, the specs for the various standards are fundamentally incompatible. You simply will not be able to implement those radios in the same system and use the same front-end. It’s unadulterated marketing BS. Hard, but too hard for a $100 ic? They sell hardware to telcos, personally I see no BS in their claim, two TX antennas and two RX antennas, multiple clocks (more than you can shake a stick at) and a 40k Logical Element FPGA on paper it is not like it is impossible to run GSM and Bluetooth most mobile handsets can do it (granted it is much easier for a dumb handset, all the heavy lifting is done in the Base station subsystem). Except the chip only puts out 0 dBm. You’ll need 20-40 dB of gain after that for a usable (and in many cases standards-compliant) radio. Incredibly broadband, linear gain, depending on what standards are of interest. If you look at the graph on page 35 it shows a maximum of +10dB and a minimum of about -17dB. My guess is that the output power is in and around that level for FCC compliance, to qualify as test equipment and avoid having to be certified. LTE is very demanding front-end wise. If it can do that it can do most other older standards. Bluetooth should be easy. Probably the PLL cannot hop fast enough to do the frequency hopping, but it has an NCO that can be used to digitally hop the frequency which works instantly. But that’s the thing…it’s not doing that. It’s generating the modulated carrier, receiving and demodulating the signal. It’s putting out 0 dBm (1mW), which is a couple of orders of magnitude short of being a useful amount of power for actual communications. Even that is with external (narrow band!!) tuning. Note the triple-stub tuner in Figure 25. When set up in a broadband 50 ohm environment, expect the transmit power to be even lower. I backed the product, I have read a lot about their chips, dissected their source code. I feel people should back the product if they want cheap hardware. But I have also pointed where to get cheaper antennas and pigtails. I’ve been on this site for 5+ years search for my username and you will see thousands of posts. I’m no shill. oh grandpa, nowadays its all digital domain, as long as you can sample enough bandwidth you are fine. Okay, that made my day, thanks! Nope, still not feeling it. What, exactly, would a front-end architecture look like that would accommodate LTE, WLAN, BT, and any of a number of different other standards (and proprietary schemes) you’d care to throw at it, *and* be future proof? Well, first of all you’d need a power amplifier with sufficient linearity to cover the peak-to-average power ratio (PAPR) of LTE while meeting its stringent spectral regrowth specs. Okay, fine, the cellular base station guys do that all day long, though it’s not particularly cheap, compact, or efficient. Now make that PA broad-band enough to cover the 2.4 GHz ISM band. Dicey, but maybe still doable. 900 MHz? At what point do you throw up your hands? You’re simply not going to do 10W with fantastic linearity over 4+ decades of frequency. Okay, so let’s move to a bandswitched approach. How many bands do you need to cover to satisfy everyone? With what linearity? Harmonic performance? Efficiency? At what cost? Next: receive. You ever try to build a low-noise receive frontend to cover one band? What was the intermod performance? IP3? Noise figure? Bet you could hit those specs over a few tens of MHz, maybe even an octave if they’re not terribly stringent. Four decades? Nope, not a chance. Again with the bandswitching. Oh hey, you’ve got an in-band image issue? Bet you wish you could filter. Haha, nope, not if you want a Swiss army knife. Let’s talk concurrent operation. Smartphone designers spend a whole lot of time figuring out how to structure their radios to prevent the Wi-Fi and BT transmitters from desensing the LTE Band 1 receiver. Lots of filtering and shielding, and many times it still takes a few tries. That’s 2-3 known standards. Extend that to N standards where N is unknown, ever increasing, and already large. Remember above how we had to band-switch our transmit and receive chains? What happens when three different radios need to transmit and receive on three different bands? Who gets what when? It’s a trainwreck. How about two different standards transmitting in-band. What’s that transmit intermod look like? Again, no fair filtering. With band-specific and likely application specific front-ends, I see the LimeSDR being a really neat tool. I’m an early-bird backer. As a DC-daylight does-all radio out of the box? No way, not a chance. JEESH How many different crowd funding sites ARE there? Btw. Crowd Supply has 100% success rate for delivery, their approach to crowdfunding is really different. Some well known open-hardware projects like Novena, USB Armory or Librem Laptop has been successfuly funded there. All the specs seems very promising for this price and LIme Micro has endorsed open source SDR from early on. However I don’t understand why they have chosen Hirose U.FL for the RF connectors. They are designed for 30 mating cycles which makes sense for mini-pcie wifi or 3G interfaces inside laptops. For an SDR platform one would often change the antennas and connections. An obvious chose would have been any SMA connectors which support around 500 mating cycles. Of course one can always use adapters, but adapters introduce insertion and return loss. Another minor annoying issue is the choice of USB type A connector which exceeds the board sedimentation. It’s just not tidy in my opinion. I think type B would have been a better choice and does not require one more extension cable. Likely because everybody will be using SMA or N pigtails to the u.fl connectors. They even sell a set of u.fl sma pigtails and antennas for it. The second reason is that using adapter cables instead of SMA’s is space and making cases. This way the enduser has much more flexibility when it comes to the case selection and design. The board is also a 12layer design (I cloned the git repo and took a look in Altium) with stuff in the layers under the u.fl’s. SMD SMA’s might not be sturdy enough. But I do agree that cheap cables might not have the best returnloss nor PIM performance. But this is not telecom grade stuff, more like something for hobbyist and academical setting, so it might not be a huge problem. On the USB connector front I agree. I guess they choose the male USB3-A so that it could be plugged in to stuff like laptips directly, as bad of an idea it is. It might also be that USB3-B cables are less available than USB3-A. Anyway, I’m designing my own case for it instead of the acrylic and aluminium one’s they sell. I’m not playing 200usd for a plastic case or 300usd for an aluminium one. I’ll most likely stuff it inside a hammond box. I already made a .step model of the pcb with reduced detail for CAD’ing the case work all nice and professional. I’m also planing on (so it might happen at some point) designing a simple 4layer or 2layer PCB with the same dimensions and connector locations as LimeSDR for testing out cases. As the LimeSDR will ship in December 2016 at the earliest and it’s hard to build cases for thing you don’t have at hand. Never has the need for a U.FL SMT plug been more pronounced! I wonder if there’s some other hack that could be brought to bear for that. I’m loath to buy (up to) ten adapter cables just to tie this thing to a filter/amplifier/switch board. All files are available, KiCad style. Any suggestions on design would be appreciated. Especially, do I include power, usb and user LEDs on Front Panel? Thanks for the explanation. I think as you mentioned it is about the board size, 8 SMA connectors would have taken much more space. One should keep in mind though to fix and screw the pigtail adapters on the case, otherwise having the cable wobbling around can easily damage u.fl connectors. Nice that you are planning early for a proper case. I really like the the rugged case of MatchStiq http://epiqsolutions.com/matchstiq/ which also has a SBC to make it fully independent and suitable for embedded applications. I am thinking of doing the same, putting LimeSDR and a SBC supporting USB 3.0 together in a rugged aluminium case. Beagleboard X15 https://beagleboard.org/x15 seems to be a very good candidate. It has USB 3.0 , plenty of RAM, two C66 DSPs four PRUs and two M4s. It even has two 1G Ethernet interfaces which is sufficient for forwarding full 61.44 MSPS raw IQ samples. It would be an interesting mix of technologies and I am curious to see if DSPs and PRUs enables more applications than the on-board FPGA. 3 RX , 3 RX , 2 TX, 2 TX and 1 external reference clock. (bottom right, near the USB connector). There are two connectors on the board for a fan (J19 and J20) ? I wonder do the cases need extra cooling. I should pay more attention ! 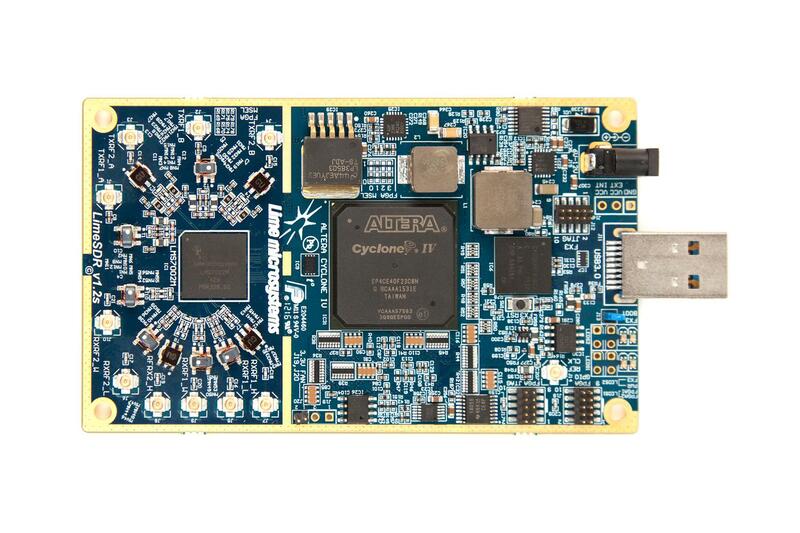 According to https://www.altera.com/products/fpga/cyclone-series/cyclone-iv/features/cyiv-power.html the Cyclone IV power is well below 200 mW and hence no need for cooling. The RF chip consumes at most 880 mW in full 2×2 MIMO mode (550mW in SISO mode). The USB 3 interface chip should also be very low power. The voltage regulator has a very good heat-sink. The clock source is a VCTCXO 30.72MHz ±250 ppb , therefore temperature compensated. I would say no active cooling is required but I am no expert on this topic! 61.44 MSPS IQ is 122.88 MSPS Real, each sample is 12 bits so in theory that would be 1,474,560,000 bits/second. *If you read the “AM572x Sitara Processors Silicon Errata (Silicon Revision 2.0, 1.1) (Rev. H)” for the am5728 CPU one of the Ethernet ports (RGMII2) is Limited to 10/100 Mbps. It is a very nice board though. Good catch, I though both interfaces operate at 1 Gb/s simultaneously. It is actually a 10/100/1000 2-Port 1Gb switch, so that is worse. The maximum with both are combined is 1,000,000,000 bits/sec. Just informed (I am a backer) that there is now the option to change to a micro B style USB connection. I’ve concluded that they must be selling these with a really tight margin, and my question is why ? The LimeSDR board has 7 ground planes between the clock layer and the top of the analogue section of the board. It has very few clock traces go to that side of the board. On paper it is a good solid design. I just do not get why they are selling these boards this price. Are they dumping old stock before they start to ship their new LMS8001 chip that goes from 100kHz to 12GHz. Although to be fair this crowd campaign will not ship many units (~2000 chip/boards if they just reach their funding goal). I should probably add that I’ve just backed it as well. I went with the USB type B connector but that delays delivery until Dec 2016. I have wanted to get an SDR for so long I guess I can wait 6 more months. Anyone know when the $199 early birds get theirs? I hope it gets fully funded. They are so close that I cannot imagine they would cancel it all now. I’m finding the LimeSDR with the four antennas and aluminum case to be a great white noise generator, but I have yet to hear it do anything else. I’ve looked at example after example, installed lots of Ubuntu packages, git cloned and built from the source, and still nothing.